You may already know that differences in brain chemistry affect how men and women communicate, but did you know that the same type of dissimilarities impact our health, happiness and ability to maintain passion in a relationship? Dr. John Gray, the author of “Men Are from Mars, Women Are from Venus,” says that mineral deprivation and the Mars/Venus principle both play a significant part in relationship issues, as do sharp increases and decreases in sugar levels. Simply put, men and women have different nutritional needs but don’t usually fit diet to gender. Plus, understanding and accommodating our individual foods requirements has become significantly more important since we’re not getting the nutrients we need from our food because synthetic fertilizers have depleted farming soil of the minerals essential to our wellbeing. Additionally, our water is impure and we’re getting less oxygen because the air is polluted. To make matters worse, we’re all living with consistently higher levels of stress on a daily basis at the same time that many of the foods we’re eating are sending us on roller coaster rides of emotional ups and downs. Specifically, minerals are essential for producing the metabolic or digestive enzymes necessary to activate all the processes in our bodies. Deficiency makes our bodies less able to digest proteins properly which means that we don’t produce enough amino acids to give the brain enough of the two main chemicals in the brain that affect moods, emotional responses and arousal levels (dopamine and serotonin). Men are more likely to have low levels of one; women the other. 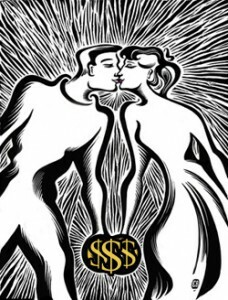 At the start of a new relationship both genders produce greater levels of these brain chemicals so the two people involved feel caring and passionate and are able to give and receive what they need from the other partner; over time, however, if they aren’t getting enough minerals, imbalances occur and problems ensue. Men produce less dopamine than they need and require more activities outside the relationship to help them experience pleasure. Most often work becomes the top priority because there are more opportunities to stimulate dopamine production through the “high” that comes from feeling successful. Sports, making money, driving fast and other risky activities also increase the amount of dopamine. In addition, men have the gene that converts alcohol into dopamine whereas women react to its sugar content, which may lead to a physical “crash.” Women are also more likely to have low serotonin levels because they need more of it to relax the emotional part of the brain than men do. The things that give them pleasure, like nurturing, feeling romantic and receiving empathy, also produce more oxytocin, which is the love hormone. Chemical levels are also impacted greatly by the ongoing stress that comes from life responsibilities like meeting the mortgage and paying utility bills. Our bodies respond to stress by elevating cortisol levels which is fine when there really is an emergency; the fight or flight phenomenon uses up the extra cortisol we produce and then allows the body to rest. Constant stress, on the other hand, results in a build up of this chemical, which inhibits our ability to burn fat. For women, who are more indoctrinated to worry about body image, high cortisol levels have a negative emotional affect on their ability to feel good about themselves and their sexual desires. They may turn to high-sugar comfort foods, which only make the situation worse across the board. 3. Drink a glass of lemon juice, water and aloe vera every morning. 4. Jump up and down for at least 5 minutes every morning to increase the amount of oxygen and endorphins entering your body. You’ll have more energy, think clearer and start the day off feeling better than you would otherwise. 5. Replace your usual breakfast with a protein shake. Add ground flax seed, apple and ground almonds. Use molasses to sweeten. Join The Discussion: please add your comments about this article below! On the praise of a person I care to this supplying. Real extraordinary. This is helpful as it explains some of the issues that we hav tended to take for granted.